Dinner can be delivered to you on the wing when you accent your table with elements from the Song Bird Fine Dining Collection. This collection is all about our feathered friends in their various shapes and sizes. Each piece in this collection draws on their elegance and appeal, creating a collection of cool and interesting accents that will leave your guests awestruck. Made primarily in quality pewter, the elements of this collection embody the freedom of the bird. Trays, plates, and serving dishes all take the shape of impressively detailed wings and feathers, all of which look as though they might effortless glide from kitchen to table or from guest to guest. All are sturdy and strong, ensuring that each one can easily hold light dishes like appetizers or heavy dishes like roasts. Since many are pewter, the trays can also be refrigerated as well, making them the perfect choice for keeping appetizers or dessert finger-foods chilled. If you need something to help your meal and your style take to the sky, then look no further than the Song Bird Collection. Not only will it elevate your decor but it might also leave your guests singing your praises too. At your next dinner party, make sure your servingware displays the same level of quality as your food! 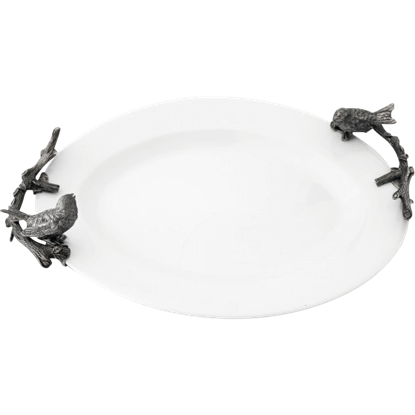 With stunning detail in fine pewter, the Feather of Icarus Tray is a beautiful serving piece for any occasion. 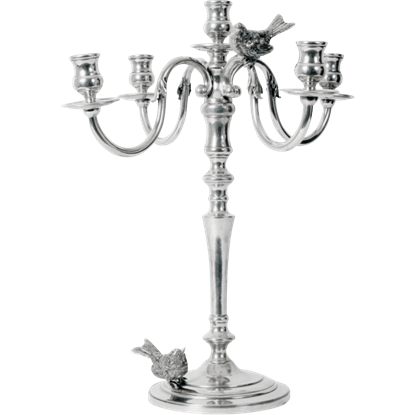 Accented by a pair of detailed pewter songbirds sweetly singing to each other, the Five Taper Songbird Candelabrum displays one delicate bird perched on a gracefully curved arm, while the other one rests on the base. The Large Songbird Stoneware Tray brings the beauty of nature to your table. This lustrous stoneware tray features a hand-glazed and twice-fired white finish that provides an elegant backdrop for your culinary creations. 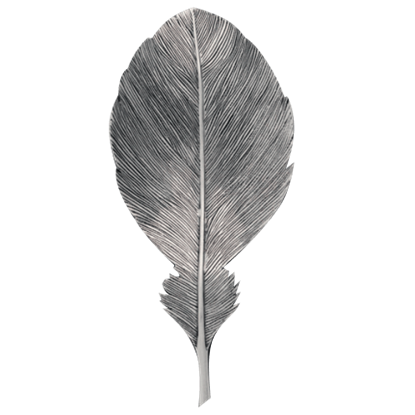 Evoking the timeless grace of scrolls and quills, the Pewter Feather Napkin Ring possesses the soft beauty of angel wings and forest songbirds. 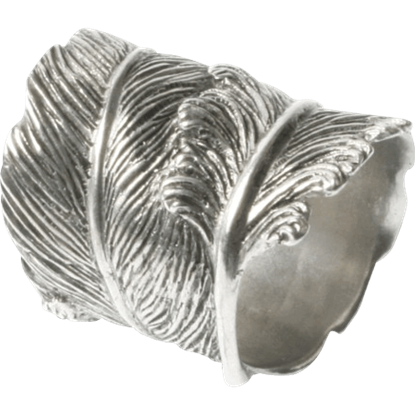 This lovely curled feather napkin ring is perfect for using with cloth napkins. The Small Songbird Stoneware Tray brings the beauty of nature to your table. This lustrous stoneware tray features a hand-glazed and twice-fired white finish that provides an elegant backdrop for your culinary creations. Prepare and present cocktail condiments or finger foods on this lustrous acacia wood bar board. The Songbird Bar Board displays a detailed pewter songbird embellishment on one side as a unique nature themed decoration. Present your hand-picked gourmet cheese selection on this lustrous, golden toned wood board for an eye-catching display. 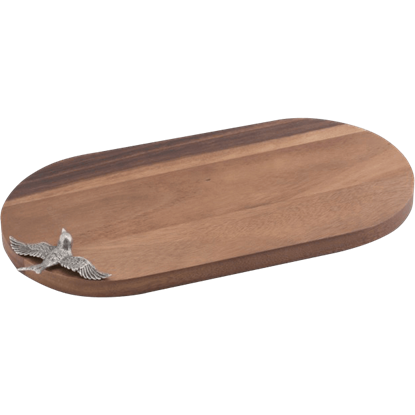 The Songbird Cheese Board is finished with a charming pewter songbird embellishment along the edge. You might imagine hearing trills and tweets coming from the Songbird Condiment Bowl whenever it is out on your table. 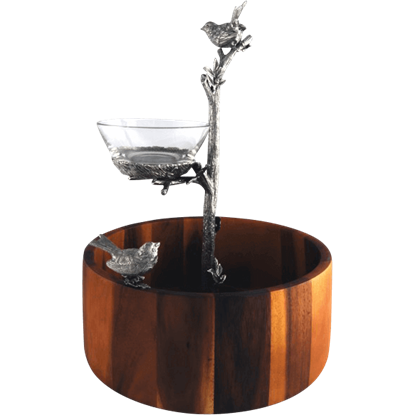 This glass dip bowl displays a sweet pewter songbird perched on a detailed oak branch along the rim. 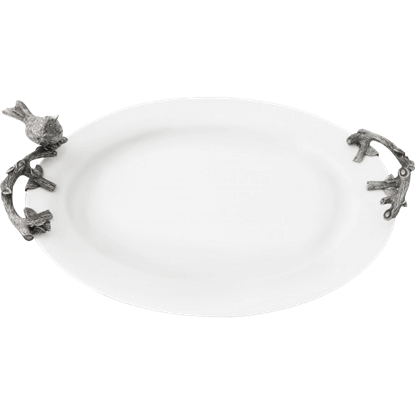 With its striking, nature-inspired design, the Songbird Double Condiment Bowl Server makes a great servingware option for your next dinner party. This songbird condiment server includes a pair of removable glass bowls. 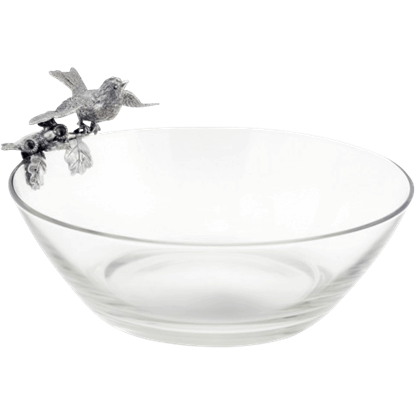 This heavy, crystal clear glass serving bowl is the perfect vessel for showcasing beautiful culinary creations. 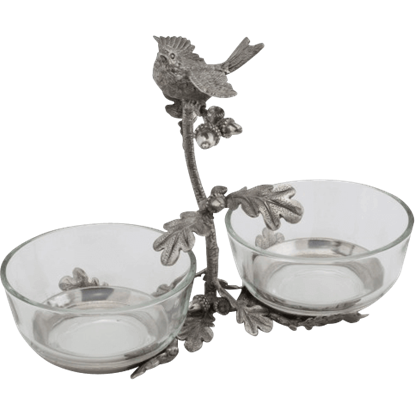 The Songbird Glass Bowl displays a sweet pewter songbird perched on an oak branch detailed with leaves and acorns. 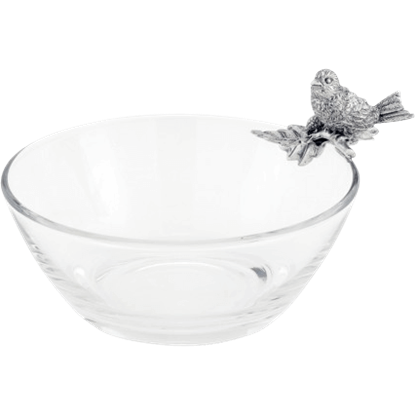 The Songbird Nesting Dip Bowl features a pure pewter tree branch cast in exquisite detail that acts as handle and perch for a nested glass dip bowl. This unique serving bowl includes a gorgeous acacia wood bowl as its base. 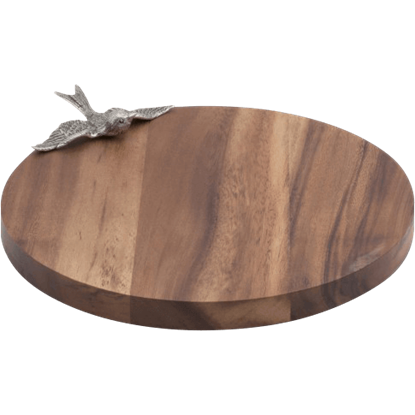 A sweet and sophisticated way to serve chips and dip, the Songbird Ring Serving Bowl comes as a two piece server. 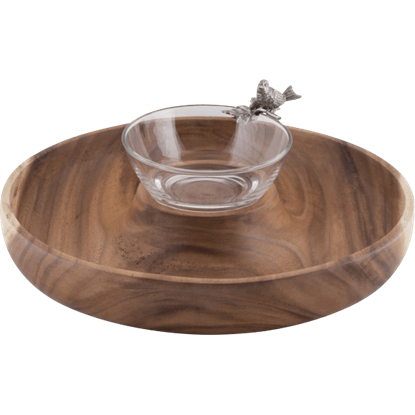 The round chip bowl is hand-crafted from lustrous acacia, while a glass dip bowl sits on the elevated center.